The deck is kind of a spin on Hatebears, as the off-tribe Thalia, Guardian of Thraben and Leonin Arbiter may well hint at. 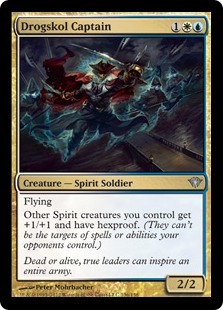 The deck is very much a tempo deck looking to disrupt the opponent and then fly over with a team of powerful fliers. The card that really attracted my attention was Curious Obsession . I was really interested to see if that could really be a Modern playable. Our one-drop Spirit and a nice powerful one at that. 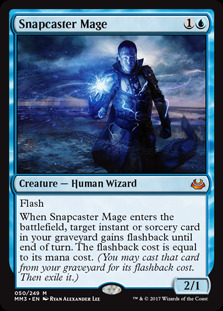 Wanderer is a beater and a counterspell in one-neat and cheap package. It can protect the team or beat face and fills both rolls nicely. The only slightly awkward part is that ideally we are playing a lot of our Spirits are instant speed which makes the pumping of Wanderer often a little awkward. Rattlechains is one of the better tribal Spirit cards. It can be flashed in to protect one of our Spirits and also gives all our other Spirits flash (though a good number of them already have it). Image isn't a Spirit but it can copy any of our Spirit creatures. Copying a Drogskol Captain gives all your Spirits hexproof and also gives the Image hexproof to prevent it's drawback ever becoming a problem. 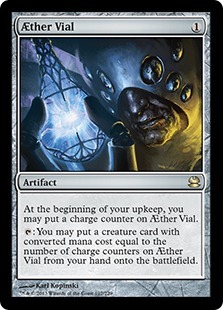 There are various other good copying targets, particularly if you are using AEther Vial to put Image into play - including Rattlechains and Spell Queller . 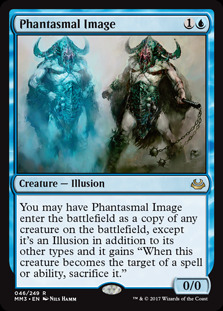 There is also the option of copying your opponent's creatures which can be very effective if the opponent is dropping large creatures into play. 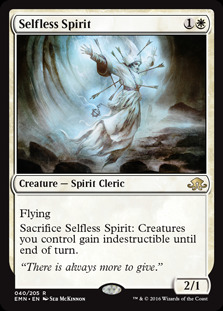 Selfless Spirit is a solid two-drop Spirit and another creature that can help protect the rest of our our team. 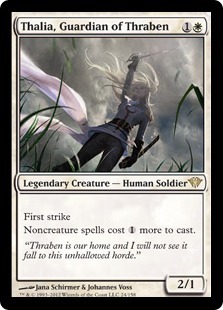 Along with Leonin Arbiter, Thalia creates the Hatebears aspect of the deck. Taxing spells is very powerful against spell heavy decks and Thalia can do a lot to stunt the early growth of an opponent's game plan. 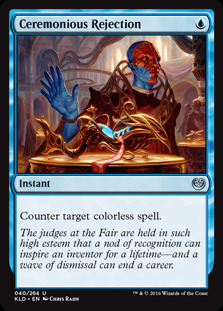 Arbiter is another Hatebears/Death & Taxes staple that hates on searching. Arbiter is insanely good against certain decks, such as Tron and Scapeshift which are heavily focused on searching their libraries. The Spirit Lord that gives the powerful ability of hexproof to all your other Spirits. The well-known combo is that once you have two Drogskol Captain s in play neither of your Captains can be targeted and so all your Spirits are Hexproof and untouchable. 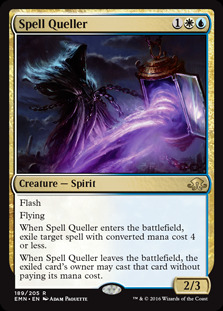 Spell Queller is an excellent tempo card and kind of personifies what I feel is the ethos of the deck. At heart this is a tempo deck that is looking to disrupt the opponent's mana, counter their removal and set back their game plan long enough to win the game. Spell Queller can set back the opponent a long way as you counter their spell and add a new flying threat to the battlefield. It's also a Spirit so we can protect it with Rattlechains and it gets pumped by Drogskol Captain . This was really the card that attracted me to this decklist. Curious Obsession is an improved Curiosity of sorts and the idea that it might actually be Modern playable really intrigued me. Our deck is filled with flyers so hooking this onto a cheap flyer can lead to a nice source of card advantage. The disadvantages are very real though. The general card disadvantage of having the creature you attached your Aura to killed is there as is the possibility that attacking no longer becomes a good option in which case Curious Obsession falls off. The theory is that you have a lot of ways of making your guys Hexproof which makes this aura that much better but I am not terribly sold. I really wanted this card to be good but it disappointed. 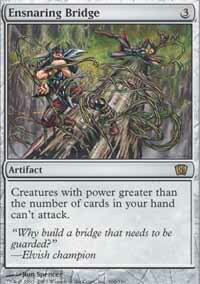 It also doesn't have much synergy with Thalia, Guardian of Thraben which can be frustrating. One of the best removal spells in the format and a card that provides an answer to the majority of the creatures in the format. 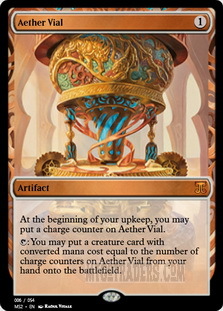 Vial is a staple of Death & Taxes decks and so it's no surprise to see it here. That said I am not sure this deck is quite as obvious a Vial deck. Rattlechains can give our Spirits flash and a good number of our creatures already have flash. There are some good tricks with Vial though, such as vialing in a Spell Queller or vialing in a Phantasmal Image as a Spell Queller in response to a spell. Additionally you can vial in a Rattlechains , Drogskol Captain or a Selfless Spirit to protect the team. 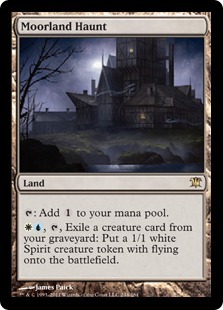 I don't remember ever playing Moorland Haunt in Modern but it is surprisingly effective. 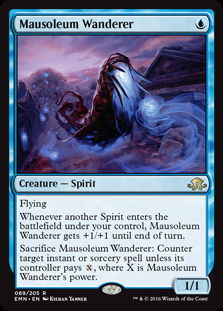 Being able to turn creatures in your graveyard into 1/1 flyers that are also Spirits is actually really powerful and doesn't take that much of a commitment. 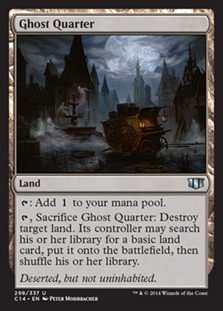 Ghost Quarter helps disrupt non-basic lands, such as Tron and Eldrazi Temple , and also can act like a Wasteland in combination with Leonin Arbiter . Dunes is a nice utility land. It takes quite a bit of work to get to actually use it's ability but with our group of flyers the additional damage that we can force through can be useful. Stony Silence is a powerful card against artifact heavy decks such as Affinity, Tron and Lantern Control. It turns off a lot of their powerful artifacts and makes life very difficult for them. 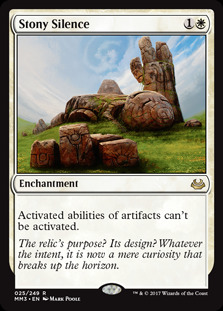 It is a non-bo with AEther Vial though so you may want to bring out Vial if you are planning to use Stony Silence. Rest in Peace is a very powerful graveyard hate card. Very useful against Dredge, Storm, Snapcaster Mage decks and other decks looking to do degenerate things with the graveyard. Settle the Wreckage is an interesting choice. 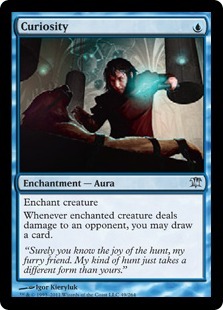 It's a card I quite like because it is a rare card that punishes a player from attacking with all their creatures. Playing around it can severely slow your clock but not playing around it can be equally devastating. That said I am unsure whether this is the right deck for the card. 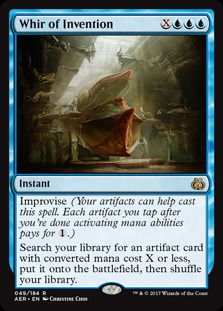 There are no other four drops in the deck and so it's kind of a stretch of our mana. I'm not sure it's an ideal option, however, it can provide blowouts against fast creature-based decks like Affinity or Zoo. 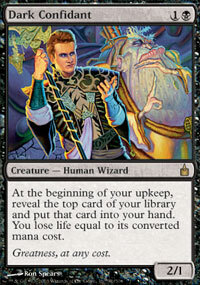 Unified Will is a very good counterspell, provided you have more creatures than your opponent. This is very good against combo decks or any matchup where we need to stop a key spell from resolving. Ceremonious Rejection is a solid card against the artifact heavy and Eldrazi-based decks. 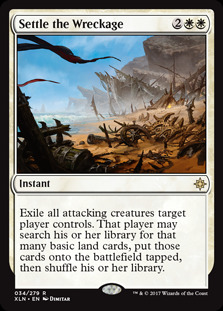 Affinity, Tron, Lantern Control, Eldrazi Tron and Eldrazi Aggro are all decks where this can come in handy. 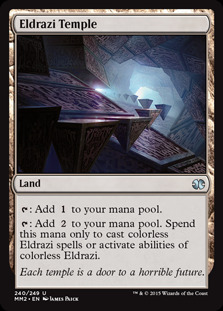 I noted in my matches that our deck struggles with cards like Ensnaring Bridge and Chalice of the Void and this can help prevent a Bridge from sticking. 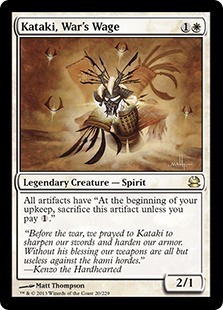 Kataki, War's Wage is an fun sideboard card as it is a powerful artifact hate card and a Spirit to boot. It can be very good against Lantern Control and Affinity and a pain for some other decks too. 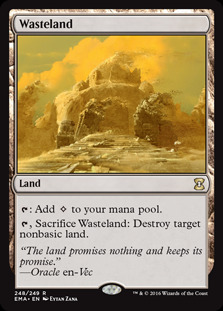 That said if all the opponent needs to do is maintain an Ensnaring Bridge in place then the 1-mana upkeep cost is a small price to pay. 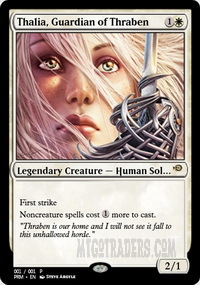 Thalia, Guardian of Thraben and Path to Exile provide you additional copies of main deck cards. 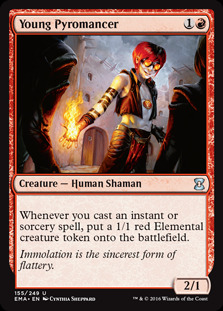 Thalia is very good in spell heavy decks like Storm and the Control decks of the format. Additional Paths give you more options removal against decks that have must answer threats. Our first matchup is against Jund. Jund is becoming very popular after it made up the majority of the decklists at the MTGO Championships. This matchup went pretty well for us but our opponent certainly stalled and we had some pretty powerful hands. I actually think Jund in general is likely to be quite tricky as we have limited means to deal with cards like Dark Confidant which can make it tricky to out tempo them. 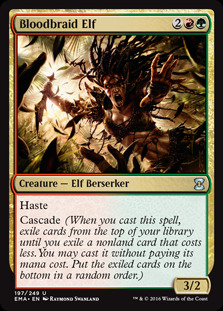 They also have good top-end cards like Bloodbraid Elf which might blow us out. On the positive side, they have a lot of targeted removal which we can use our hexproof trickery to prevent. Also, Jund is very light on flyers so there is a good chance we can fly over their creatures. Our second matchup is against Eldrazi Tron. A ran into this matchup a few times and neither time was good. 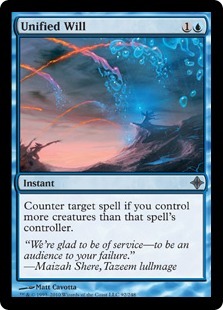 Spell Queller isn't all that great given that they are soon looking to cast spells that cost over 5-mana. 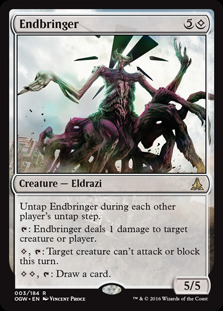 Endbringer is particularly dangerous as it can ping away our Phantasmal Image s and a lot of our creatures. 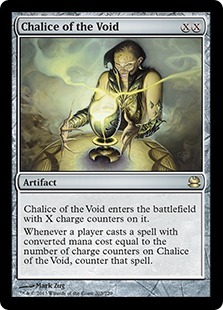 They also have Chalice of the Void , which set on 1 is pretty irritating. Our third matchup is against Lantern Control. This matchup is certainly winnable but the big problem we have is that the deck doesn't have an answer to Ensnaring Bridge once it hits play. Accordingly, we must prevent Ensnaring Bridge hitting the battlefield on order to win the game because after that it's pretty much game over. That's a big ask as they are able to hardcast it or tutor for it with Whir of Invention and the latter cannot be countered by Spell Queller . Our fourth matchup is against a new deck that has caught a bit of attention from the Modern League Decklists. I have been calling the deck Tezzerator and it is basically Lantern Control but without the Lantern Combo and instead having a more robust search package and cards like Chalice of the Void as the protective measures. You can check our mis4tune's list here, if you are interested. Our fifth and final matchup is against UR Pyromancer. This is a bit of a tempo battle as both decks are tempo-based. They have some very powerful spells and our lack of removal can make cards like Young Pyromancer and Thing in the Ice difficult to handle. However, if you can keep the tempo advantage in your favour this is a very winnable matchup. I was having a bit of a tough time with this deck so I sent out a message on Twitter. I was happy to get some responses from PureMTGO's own Death & Taxes expert. We both felt that the list was a bit disappointing but there is another list here that comes recommended from a Death & Taxes specialist. Shortly after I started working on this article, Craig Wescoe played the following U/W Death & Taxes or Spooky Taxes decklist at the Magic Online Championship. His record in the Modern portion of the Championship was a not entirely impressive 4-4 but is an interesting list in a similar vein to our UW Spirits decklist. Crag's article gives a good explanation of the deck though and there are some nice card choices in there. 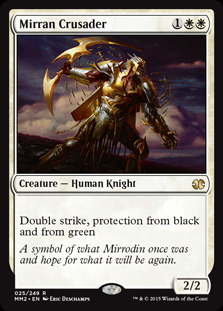 I particularly like Mirran Crusader against what ended up being a very Jund heavy metagame. Overall I was not very impressed with this deck. 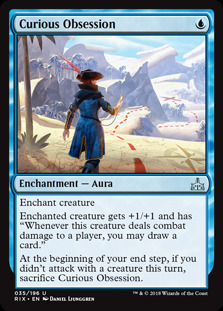 Perhaps it's just me but the deck felt underpowered and the tempo aspect walks is a very fine line. The creatures are not very powerful in themselves and so it's a bit too easy to get overwhelmed by more powerful strategies. As mentioned above there are a number of takes on the deck and perhaps a different configuration would suit better. Curious Obsession still has some way to go to convincing me it's a Modern playable unfortunately...but that's just my though, in case you were curious! No problem. Thanks for the advice. I always enjoy having someone to bounce a few ideas off. Yeah, I've been running a few decks that I've had more fun with that this one recently.